Beth is a freelance photographer located in the depths of the Rocky Mountains. Growing up in Idaho and Wyoming, she has an immense admiration for the West and the people that inhabit the landscape. Her work centers around telling the stories where humans and nature intersect. On my first trip after purchasing a used vintage RV, I towed it from Idaho to Colorado. And after two days of beautiful weather, on the third day, it began to rain. It’s normal in Colorado to get a few afternoon showers in the summer, but that day, the rain didn’t stop. As it poured down, I scanned my surroundings for signs of trouble. Two minutes in, all seemed well. Five minutes in, a drop appeared on the inside of the window seal. That drop turned into a trickle. Another trickle formed on a different window, near the dinette. Then, on the roof and near the refrigerator. I had uprooted everything, sold my possessions, depleted my bank account, and bought a new towing vehicle to move into this 200-square-foot space. I had no idea how to fix a leak! Who knew what kind of other damage it was causing? What happened if the tow lights stop working? Or the fridge and water lines? When the storm ended, it left me with an unwavering sense of anxiety. Living or traveling in a vintage RV will always have its quirks, but there wasn’t a repair man I could call. My dad, who normally helped me with things like this, was over 600 miles away. The community I’d found was more than willing to help, but most of them had no experience with RVs. I’d have to figure things out myself. 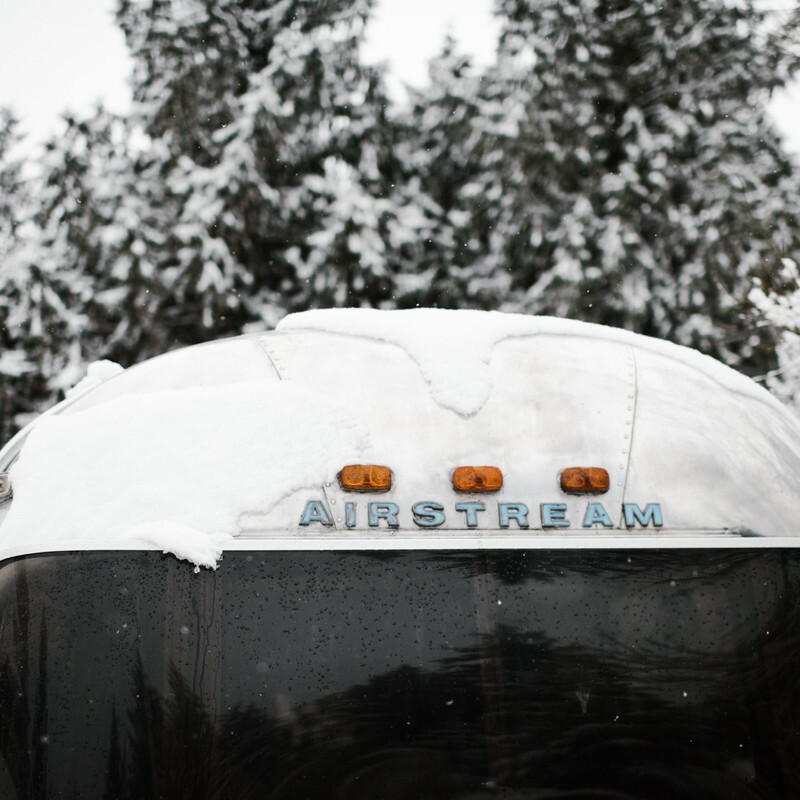 My first snow in the airstream. After a series of deep breaths, I began researching. I found that the leaks were likely due to old sealant around the windows cracking from low humidity and sun exposure, which meant it was a normal and entirely mendable maintenance issue. After a few YouTube videos and how-to articles, I bought the recommended sealant online and prayed for dry weather until I could repair the cracks. So of course, it rained some more. Taking a trip to the hardware store, I improvised with tarps and bungee cords to buy myself time. In the end, fixing the leaks was a simple process and I walked away from the experience equipped with a new skill and sense of empowerment. Now I know to do regular maintenance on my RV before bad weather hits: re-sealing and caulking the seams, insulating the pipes, and a number of other checks I’ve learned to do along the way. 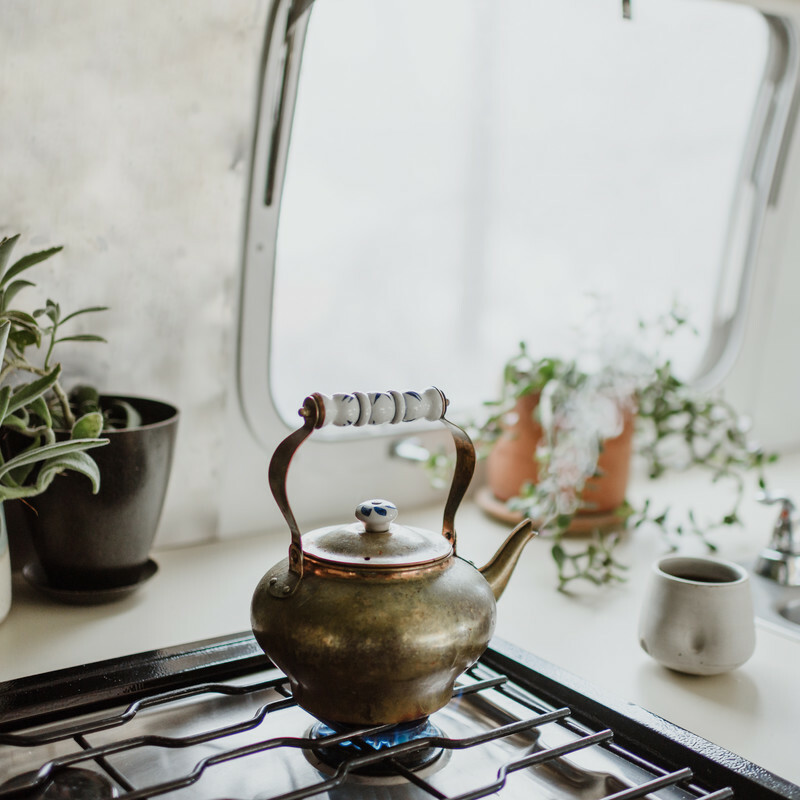 Plants, handmade pottery and a vintage kettle make my space extra comforting and cozy, even during a storm. Have provisions on hand. A spare tarp, extra bungee cords, and one or two tubes of sealant come in handy when you encounter a surprise leak. A syringe filled with sealant will help you get a fine-bead application on seams, and mineral spirits will clean up the residue. You can store the unused sealant in the freezer for future uses. Have at least two forms of heat in case one encounters a problem or you have limited electric hookup. I use a propane furnace and a space heater. The propane furnace will ignite off of the 12V battery and use propane as fuel, while the space heater uses shore power. Make sure to fill your propane tanks before cold weather hits, and charge and test your battery if you’re off-grid. My propane furnace is really powerful and I often only use it for an initial blast of warmth before switching to a space heater to retain the heat. Make sure to buy a space heater that automatically turns off if tipped over, and keep it away from anything flammable. Have extra blankets or a sleeping bag stashed away. If you are hooked up to shore power, an electric blanket is a great investment. It keeps you warm while you sleep without having to add extra heat to the entire trailer. A down comforter or two is also a great, inexpensive way to stay toasty at night. 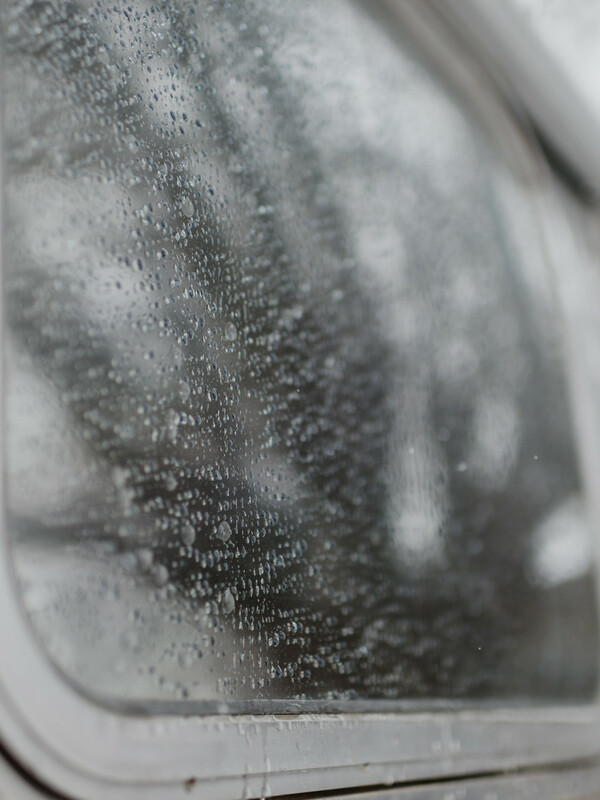 Covering windows with thick curtains or reflective foil insulation will help retain heat. Cover the windows at night when it is coldest, and open them up during the day to let the sun in. Rugs on the floor also help retain heat. 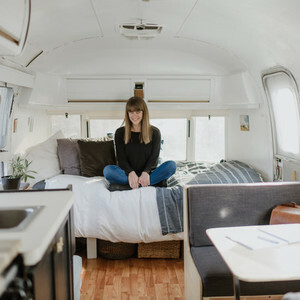 If you’ll be camping or parked in prolonged cold weather, you can buy or build a framed skirt to go around the bottom of the RV, reducing the cold air sweeping below you and greatly increasing your insulation. Some people use straw bales for this, but they can be a fire hazard and an invitation for rodents, so I advise against it. And don’t forget to insulate and heat any exposed pipes. Use online forums and the RVing community as a resource. I use Airstreamforums.com all the time. It is an invaluable tool when something isn’t working properly, or if I’m researching something like towing capacities. If a post doesn’t already exist, you can submit your own question and someone usually answers or points you in the right direction within a few hours. Likewise, your local RV park will have staff and guests with a wealth of knowledge and an eagerness to help. There is nothing like the camaraderie of the RVing community. Drink something warm. 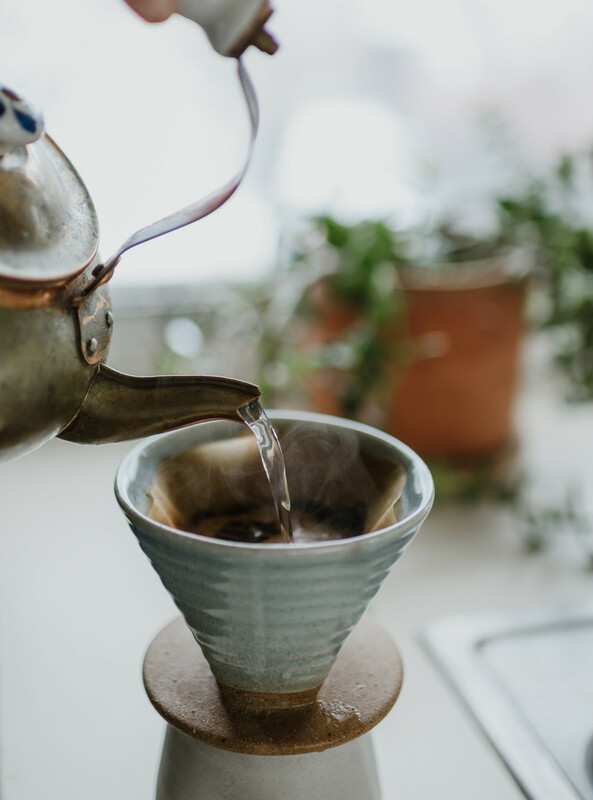 Use a stovetop or electric kettle to boil some water and drink hot cocoa, tea, or coffee to warm your core. Use your favorite mug, grab a good book, put on some thick socks, and listen as the storm passes by. 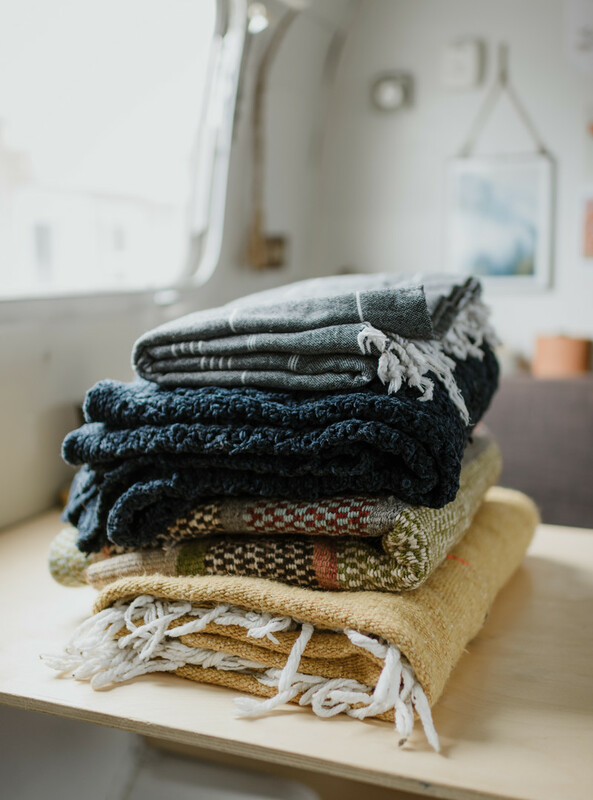 Stack of blankets collected from my travels, stored for those times I need extra warmth and coziness. Making pour-over coffee in the morning is my favorite ritual.